Premier Travel launched the Premier Apprenticeship Scheme in 2016 in conjunction with Cambridge Regional College to help those keen to work in the travel industry to get their first foot in the door. Anyone interested in future apprenticeship roles should keep an eye out here for dates when we are next recruiting Apprentices. 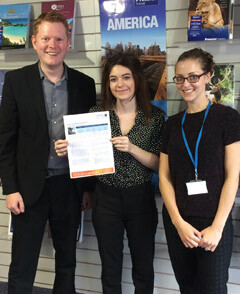 Kayleigh Rowland started her apprenticeship at Premier Travel’s Swaffham branch in July last year. “What I’ve enjoyed most is selling a destination to a customer and hitting people’s expectations,” she explained. “I’m proud of some of the things I’ve achieved in such a short space of time: in December I was crowned the top seller in our branch which was a real confidence booster and I’ve also learned a lot about trade regulations and how these affect the business I work in. “The one area I’ve loved the most is being able to learn about different countries and what they have to offer, and being able to use this knowledge to make people’s dream holidays come true. One customer contacted me shortly after they returned from a Singapore and Hong Kong itinerary which I put together for them; they thanked me for all the hard work I put in – it’s things like this that make my job amazing. “There are three of us based at our Swaffham branch and we work together as a team to hit our monthly targets and share knowledge of places we’ve travelled to in order to help each other sell. They have really helped me build up my skills base and are always on hand for advice should I encounter any problems. 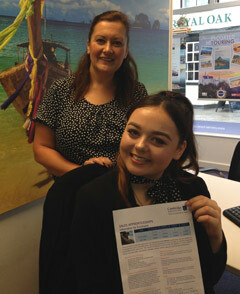 Beth Collins began her apprenticeship with Premier Travel in July, based at its St Ives branch. “Prior to the apprenticeship I studied Travel and Tourism at Long Road Sixth Form in Cambridge, where I was lucky to get the chance to go to New York,” she explained., “This is where my passion for travel really evolved; after college and until my employment with Premier, I worked full time at a supermarket but after six months I decided it was time for a career change, preferably staying in retail as I enjoyed the industry. “I signed up for the apprenticeship scheme to gain an understanding of sales and pursue my passion for travel; my mum has always worked in sales and has been quite successful in the industry, so I liked the idea of working in that kind of role too. I’m definitely finding it motivating and interesting - every day is different. “I have learned so much in the time I’ve been doing my apprenticeship such as how to speak to clients on the phone and on email, customer service, the legal, regulatory and ethical requirements in the industry and about various destinations; it has really set me up for a career in travel and sales. “My main achievement is seeing my sales figures increase. I feel very confident doing the booking process and sale cycle. Once I have put together an itinerary for somewhere new it is a tick off of my list and I then feel confident in selling that destination.